SAN DIEGO, CA. , May 30, 2018 (GLOBE NEWSWIRE) -- Reis & Irvy’s, Inc., (OTC: VEND) (www.reisandirvys.com) a subsidiary franchise concept of Generation NEXT Franchise Brands, Inc. (www.gennextbrands.com), today announced its first 50 location installs that are scheduled to receive the first production run of fully-automated frozen desert vending robots in the month of June. The patented technology, manufactured and assembled by Flex, Ltd (www.flex.com), will feature frozen yogurt produced exclusively for Reis and Irvy’s from Dannon YoCream (www.yocream.com). All deliveries and installations will be handled by Generation NEXT’s strategic operations partner, Pitney Bowes (www.pitneybowes.com), a trusted global service and logistics solutions provider. 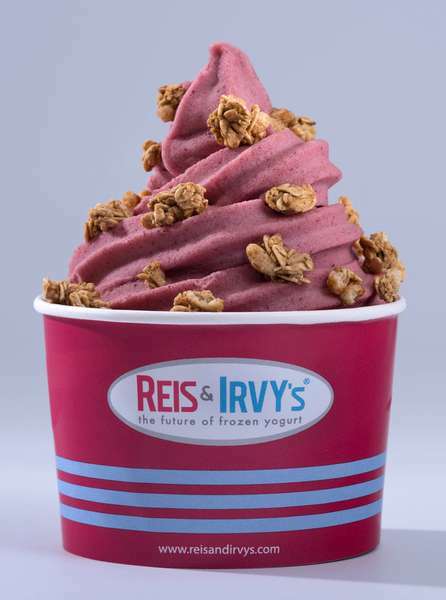 Reis & Irvy’s has been focused on finding homes across the country for the franchised Frozen Yogurt Robots in premiere, high-traffic location categories that include hospitals, theme parks, airports, family centers, movie theaters, tourist attractions, airports, hotels and Fortune 500 corporations. “Mall of Abilene is excited to introduce this fun and unique froyo experience to our shoppers. It’s something anyone of any age can enjoy in a brand new way,” said Michelle Parker, Marketing and Specialty Leasing Manager, Mall of Abilene. “We are looking forward to giving our museum guests a chance to make a truly personalized cool treat in a unique yet easy way,” said Patti Reiss, Director of Museum Experiences, Mississippi Children's Museum. “We are so excited to add Reis & Irvy’s to our concession mix for all our movie-going customers,” said Mick Stieler, CFO, COO Showplace Cinemas, Evansville, IN. For more information on the revolutionary Frozen Yogurt Robots or to learn more about how you can own your own Reis & Irvy’s Frozen Yogurt Robot franchise, visit the Reis & Irvy’s website at www.reisandirvys.com or call toll free 888-902-7558. Follow us on Twitter @Reisnirvys, on Facebook @reisandirvys and on Instagram @reisnirvys. Reis & Irvy’s, Inc. is a subsidiary franchise concept of Generation NEXT Franchise Brands, Inc. (OTCB: VEND). Launched in early 2016, the revolutionary Reis & Irvy’s Frozen Yogurt Robot vending machine serves seven different flavors of frozen yogurt, ice cream, sorbets and gelatos, a choice of up to six custom toppings and to customers within 60 seconds or less at the point of sale. The unique franchise opportunity has since established itself as a high-demand product and currently showcases a franchise network both domestically as well as internationally. For more information about the Reis & Irvy's franchise, click here.